A friend of mine just moved to Washington, D.C., and called me for a restaurant recommendation, which is funny, considering the last time I was there was the summer of 1992. An even bigger coincidence was that another friend of that era, unseen and unheard from in, oh, five, six years, had just e-mailed me from California about his own memory-lane trip back to D.C. Revisiting all our old dining haunts, he found most (alas, Fish, Wings & 'Tings is gone) still thriving. That's a strange phenomenon for those who've grown up in Hawaii, where the bulk of restaurants tend to last less than five years. I suppose D.C. is such a conservative town that it draws chefs and restaurant chains that prefer stability over short-lived culinary faddishness, and its residents are content with a few favorites. Naturally, I sent Friend No. 1 off for the stuff I crave myself, that you can't get here, such as Ethiopian food in Adams Morgan; Memphis dry barbecue from Red, Hot and Blue across the bridge in Arlington, Va.; and in the vicinity, a bucket o' Maryland blue crabs from Quarterdeck. The latter is where I developed a taste for celery -- hated it before -- after becoming addicted to the celery salt flavor of Old Bay Seasoning, used on everything from crab to french fries. I envied my friend as I lamented the absence of the seasoned goods outside the Chesapeake area. Then, miracle of miracles, I stumbled upon the Crab Tank in City Square, serving up Maryland blue crab in -- oh boy! -- Old Bay! WHILE CONTINUING to operate a shellfish wholesale business, Carl and Teri Fawcett were able to buy out the Crab Tank's original owners at Moanalua Shopping Center. They moved with partner Eric Fawcett, Carl's brother, to their current location a year ago, selling seafood -- crawfish, lobster tails, catfish -- by the pound at market prices, plus six kinds of crab. It's a perfect option for summer seafood feasts. Those who want to revel in the lazy days of summer can let the Crab Tank staff do the cooking. Their peel-and-eat spiced shrimp runs $5 for a small half-pound order, $8.50 for a pound and $13 for a pound and a half. Maryland blue crab ranges from $10.99 for a small order steamed with Old Bay Seasoning to $28.99 for 12 crabs boiled Louisiana style in Zatarain Boil. As crab aficionados know, having someone else do the cooking doesn't let you off the hook for work. Eating crab involves hard, messy labor that's not for prissies. There are some who, accustomed to snow crab legs or pupu claws, don't even know how to remove the carapace. Luckily, Crab Tank staffers are willing to patiently explain and demonstrate, even after they've probably done so hundreds of times. They're also nice about allowing diners to bring in other food for those in the party who don't or can't eat seafood. 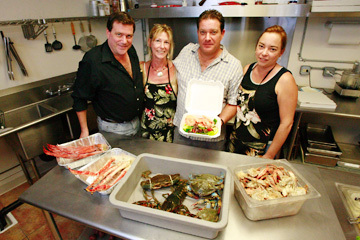 Eric Fawcett, left, Marcia Servies and Carl and Teri Fawcett of the Crab Tank in City Square offer a selection of crab, including snow, left, Alaskan, Samoan and blue, and Maine lobster. At right is a tub of garlic crab, and Carl holds a to-go order of spiced shrimp. If you go, be patient, Carl and Teri will be off-island through Thursday, marking their 20th wedding anniversary. Believe it or not, a medium order ($16.99) of six Louisiana-style crabs, served with potatoes and onions, can be enough for two. The Maryland crabs don't have a lot of meat, and it takes so much work to get at it that a typical diner tires after about three crabs. Even more varied is the Louisiana Seafood Sampler for two. The $17.99 price gets you four crabs, a half-pound of shrimp, a pound of crawfish (I've never considered these food), plus red potatoes, onion and corn on the cob liberally sprinkled with Old Bay. Please note that crab takes 20 to 30 minutes to prepare, so it's best to call ahead with your orders. Those who want to stay clean may take the hands-off approach to plate lunches. A shrimp scampi plate ($8.50) features 10 shrimp on a bed of rice, accompanied by a garden salad tossed with whole Roma tomatoes, and there is also a homemade crab cake -- a little heavier on the bread crumbs than I prefer -- served on salad greens for $6.50. If you like the scampi, you'll also like the garlic crab, served in pieces at $2.50 for a pint, to $9 for 2 quarts. Although there's room for about 14 at the Crab Tank, it was conceived mostly as a takeout joint so I did miss the accouterments associated with Quarterdeck -- the butcher paper-covered tables, bibs, mallets, nutcrackers, tiny claw-fitting forks and post-meal wipes. You might have to ask for the tools you need, and cleaning up after the meal is a matter of asking for paper towels run through water at the kitchen sink. This could change, as plans call for expanding the dining area that now comprises four tables and some bar seating. Crab Tank didn't quite live up to my memories, but few things ever do, and it's nice to know they're here when cravings arise.